In memory of the thirty-two young Dutchmen who tried to escape to England by Kayak during World War II to join the Allied Forces. Eight of them reached the English Coast. In late August 2011, Alec Greenwell, Ed Cooper, Harry Franks and Olly Hicks, all from east Suffolk will kayak the same route taken by the Engelandvaarders 70 years earlier. The route they will be following is that of a pair of brothers, Henri and William Peteri, who departed from Katwijk, several miles north of The Hague, and landed on the beach at Sizewell in Suffolk 56 hours later. Full details of the new range of paddles will be posted on the web site and sent to all dealers at the beginning of July. Sonja Ewen & Eila Wilkinson "Ireland 2010"
Sonja and Eila, along with Nigel Dennis of Sea Kayaking UK are working with the Outdoor Partnership to bring Kayaking into primary schools on the Isle of Anglesey. SPLASH funding has been secured and 12 primary schools will each be offered 10 places for pupils to receive a free kayak taster session. 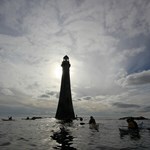 In March 2008, sponsored sea kayaker Jeff Allen set off on an attempt to circumnavigate Scandinavia. Starting in Gothenburg, Sweden, Jeff along with Mark Schoon from America, kayaked northwards, in an attempt to reach the distant town of Kirkenes, a small Norwegian port which lies close to the Russian border. More than 60% of Norway's long and exposed coastline lies above the Arctic Circle and this will be just phase one of a two phase expedition to paddle and ski the majority of Scandinavia. 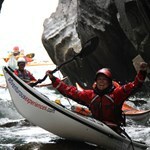 As well as being an incredible adventure Jeff and Mark hope to raise both monies and awareness for two charities. The Ovarian Cancer Action and the Children's Hospice South West Precious Lives Appeal. You can follow the expeditionhere. On the evening of Wednesday August 15th, 2007, Joe O'Blenis paddled into the Brechin Boat Launch in Nanaimo at 8:00 PM, successfully completing his solo circumnavigation of British Columbia's rugged Vancouver Island. In doing so, Joe shattered the previous speed record of 28 days, having completed the expedition in just 23 days and 10 hours! The expedition was done with support from Kokatat Watersports, Sea kayaking UK (Nigel Dennis), Comox Valley Kayaks and John Kimantas of the Wild Coast (Guidebooks and Marine Atlases). Also helpful in countless ways were a good number of people, too numerous to mention in this brief press release. Many thanks to you all! The expedition held many challenges right from the start from the dense fog at launch time to the headwinds of up to and over 40 knots for the first 17 days. Rough seas, limited landing spots and the ever-persistent winds took their toll during the expedition but despite the challenges, the rewards were equally plentiful. From the magnificent scenery of Vancouver Island to the vast array of marine wildlife with near daily sightings of a variety of whales, sea otters, seals, sea lions as well as deer, bears, eagles and so much more! The beautiful but incredibly rugged shoreline of the west coast of Vancouver Island with its cliffs, sea stacks, caves as well as number of long sandy beaches made for an amazing and inspiring journey. Highlights of the trip included camping on the outer tip of the Brooks Peninsula complete with a large bear just down the beach from my camp, rounding Cape Scott in pristine conditions, a cold can of beer in the Bunsby Islands compliments of the staff at West Coast Expeditions on Spring Island and of course finishing the expedition back in Nanaimo with the hot shower & shave afterwards closely followed by delicious chicken wings and beer at the pub with good friends! The new record, four and half days faster than the previous mark, is now there for the taking. In Joe's words, It is my hope that the record will fall within the next year or two, giving me reason to do it all over one more time, using the knowledge gained from this expedition to shave a few more days off the mark and, hopefully, beat the time from Keirron Tastagh and Jeff Norville who paddled a tandem around the island in May 2007 in a record time of 19 and a half days in a Triton double kayak. Hopefully there will be some stunning photographs from the expedition in the gallery once Joe has gone through them all! 2004 saw Jeff Allen and Hadas Feldman complete a six month circumnavigation of the Islands of Japan.Starting in Tokyo in early January, they paddled south, and after 139 paddling days they eventually closed the circle on November 4th. The cold Siberian Monsoon driven winds hampered their progress over the winter months but by early April made it as far as Tsuruga Wan on the West Coast, Visa restrictions and funds meant they had to return home at this stage. Jeff and Hadas returned mid summer to complete their journey, with nearly twice the distance still to cover they new the race against time was on and in what turned out to be the worst year in recorded history for Typhoon activity they managed to complete with only hours to spare before they once more had to leave the country due to their visa's running out. During the trip they experienced much wildlife, from Sharks and turtles in the south and Bears and eagles in the North. Jeff and Hadas presented 'Paddle Japan' at the 2005 symposium, for further details on presentations on this amazing journey contact Jeff Allen. In the summer of 1925 the Danish government relocated 90 Inuit from their original settlement of Angmagssalik, the only settlement on the East coast, to a settlement they created at Scoresby Sound. This expedition will attempt to reconnect the two communities by kayak, the original form of transport of the Inuit, by sea kayaking from Scoresby Sound to Angmagssalik, a distance of over 600 miles. The project had been growing in our minds for a long time, but had only really taken shape eight months earlier. 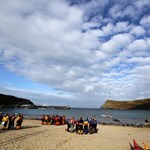 Paddle the stunning coastline, using conditions on the day to the best advantage for a weekend of individualised skills development, whilst looking out for the wildlife!